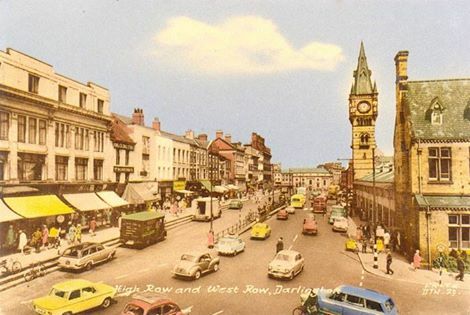 Darlington’s old High Row…this is an example of how it used to be for the 100 years prior to 2005, and this post of mine is just one response to the change which was finally completed in 2007 – there were and are many others who see this issue on these lines and also others who will think differently. I would be prepared to debate the effects of this upheaval as seen in hindsight, with any who care to engage in discussion here or elsewhere. 10 October 2014 at 12:08 · Darlington. It’s over ten years on now since the glossy brochure from the town council arrived to inform us that there were plans for re-development in the town centre. The need for the deed was debated and questioned at length, but in spite of misgivings from many, it was passed to go ahead. I still sob just as uncontrollably to myself now, as I did when the work actually started to happen in December 2005. The reason why these tears flow is that whenever I dare think about what we threw away when we bulldozed our unique old High Row up, I feel extremely sad about what my town has lost. The tourist attraction potential alone was worth millions to us, but most of all its value in reassuring us true Darlophile’s of our sense of place, and inspiring future generations to feel the same loyalty to their hometown would have been invaluable. It should have been lovingly restored. Instead, it was thoughtlessly cast aside to be replaced at great pain and expense with a bland and not particularly well-constructed street pattern, that could be…well just about anywhere. Sadly the latest version of High Row is at best merely functional and meaningless to me, and I don’t doubt that is the opinion of other ‘feeling’ people also. The loss of the symbolic old High Row and the subsequent planning problems associated with the whole redevelopment affected the economy of the town too. Pedestrianisation changed the dynamic and people flow of the centre. The new design with its far too many steps acts as a barrier to people wanting to cross from one side of the road to the other. The ill-considered re-siting of the bus stops causes inconvenience to visitors (especially the elderly or disabled), affecting mine and other people’s businesses. Even more than that it totally broke a great many hearts, mine included. My life has never been the same (since that awful time between 2005 and 2007 when the big upheaval occurred), it has been diminished. In fact, I might go as far as saying a big part of my life has been ruined. I feel lost and discontented in a place where I formerly felt that whatever was going on, at least I was ‘at home’, and it could very likely be sorted! Some will not even remember the vastly more people friendly old High Row or discover what historical significance it held and what it and its environs meant socially, which is a huge shame. Some others will not think what is written above to be important and may disagree, but this conviction that losing that fabulously historic icon was a sad mistake for Darlington to make is a fact for me and curdles my blood every hour of every day that I live. I don’t hate anyone for being so lacking in vision as to have been a part of what has been described (by people I know who feel that they understand the history of the town), as an act of corporate vandalism. I am not a ‘hater’ of people, but I do hate feeling so sad, and I don’t think I am alone in that. I partly blame myself too, for so stupidly believing that the value of old High Row was seen and appreciated by everyone. If for one moment it had ever occurred to me that was not the case, I would have moved heaven and earth to get a preservation order on it. It astonishes me to this day that no-one had seen the need to do that. I’m not being melodramatic when I say that for far too many of us, when the heart of this town (our finest ever incarnation of High Row), was demolished lots more died with it – including a vital part of me. I have never got over the shock, and hard as I try to probably never will.